John Logie Baird (August 13, 1888 – June 14, 1946) was a Scottish engineer, best known as the inventor of the first practical, publicly demonstrated electromechanical television system in the world. He had a significant role in the early history of television, and, despite his company's eventual failure, continued to do significant work on electronic television up until a year before his death in 1946. Baird was born in Helensburgh, Argyll, Scotland, and educated at Larchfield School (now part of Lomond School), Helensburgh; the Glasgow and West of Scotland Technical College (which later became the University of Strathclyde); and the University of Glasgow. His degree course was interrupted by World War I and he never graduated. Although the eventual development of television was the result of work by many inventors, Baird was one of its earliest pioneers. He is generally credited with being the first person to produce a live, moving television image by reflected light, among other major advances he later made in the field. Hastings, in East Sussex, UK, claims to be the 'Birthplace of Television' as it was there he was living for health reasons when he did much of his research work into his televisor. Hastings would claim to be the place where electro-mechanical television was first actually perfected and demonstrated. While in Hastings, Baird enjoyed the considerable support of the Hastings Radio Society, whose president, William Le Queux, was an early enthusiast of Baird's work. According to some of the interviews released as part of the documentary CD-ROM The Dawn of Television Remembered, Baird may have had far more considerable help from others at this early stage than had previously been realized. In his first attempts to perfect television, Baird experimented with the Nipkow disk, and demonstrated to the Radio Times that a semi-mechanical analogue television system was possible with the transmission of moving silhouette images, such as his fingers wiggling, in his London laboratory in February 1924. Baird gave the first public demonstration of moving silhouette images by television at Selfridges department store in London on March 25, 1925. On October 2, 1925, John Logie Baird was successful in transmitting in his laboratory the first television picture with shades of grey derived from reflected light: the head of a ventriloquist's dummy known affectionately as "Stookie Bill", in a 30-line vertically scanned image. Baird later transmitted the image of a young man working in the office downstairs, William Taynton, whom he paid to endure the hot lights then necessary for an effective image. Baird repeated the transmission for members of the Royal Institution and a reporter from The Times on January 26, 1926 in his laboratory at 22 Frith Street in the Soho district of London. It was the world's first demonstration of a true television system, one that could broadcast moving images with tone graduation. 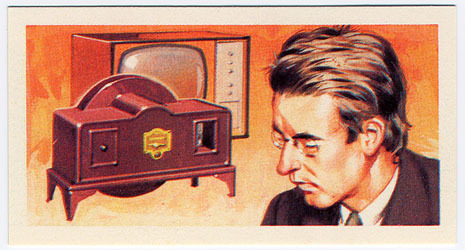 In 1928 he demonstrated the first colour television and true stereoscopic television. In 1932 he was the first to demonstrate ultra-short wave transmission. 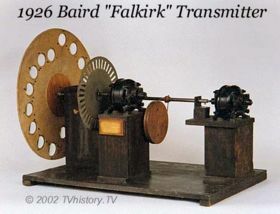 In 1927 Baird transmitted a long-distance television signal over 438 miles of telephone line between London and Glasgow. He then set up the Baird Television Development Company Ltd, which in 1928 made the first transatlantic television transmission from London to Hartsdale, New York and also made the first television programme for the BBC. He televised the first live transmission of the Epsom Derby in 1931. From 1929-1935, the BBC broadcast television programs using the 30-line Baird system. At first, the transmission standard was a 30-line image scanned and reproduced using Nipkow discs, but later cameras used a flying-spot system instead of a disc. 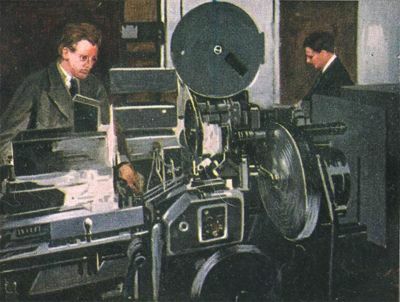 By the early 1930's, as it became clear that the BBC wanted a higher definition system, Baird began experimenting with other means of scanning, eventually moving to an "intermediate film" process which involved shooting the images on split 35-mm cinema film, then rapidly developing and scanning the film while still wet. At the same time, Baird realized that mechanical scanning had reached its limits, and the Baird company licensed the electronic Image Dissector developed by the American inventor Philo T. Farnsworth to scan the film. In experimental transmissions, the Baird company was able to send first a 180-line and then a 240-line image using this system, though dust specks from the film and other problems marred the images. In late 1936 the BBC began alternating Baird 240-line transmissions with EMI's electronic scanning system which had recently been improved to 405-lines after a merger with Marconi. EMI's system initially suffered from a number of technical difficulties, but its engineers were eventually able to overcome them, while Baird's intermediate-film process using Farnsworth's tubes remained balky. A fire at the Baird company's facilities at the Crystal Palace in Sydenham further damaged their ability to compete, and early in 1937 the BBC ceased broadcasts with the Baird system. None of Baird's early inventions were complete successes. In his twenties he tried to create diamonds by heating graphite and shorted out Glasgow's electricity supply. Not long afterwards Baird designed a glass razor; it was completely rust resistant, but it shattered. Inspired by pneumatic tyres he had a go at pneumatic shoes, but his prototype contained semi-inflated balloons which burst. He also invented a thermal undersock, which was actually a mild success. Baird's numerous other developments demonstrate his flair for invention. He developed, in 1928, a primitive video recording device, which he dubbed Phonovision. The system consisted of a Phonodisc, which was a 78rpm record that could record and play back a 30 line, 12 frames per second video signal. These recordings, though marred by problems such as mechanical resonance, have been restored by Scottish engineer Donald McLean, and have a powerful, haunting quality about them. They are the earliest recordings of television ever made. His other developments were in fibre-optics, radio direction finding, infrared night viewing and (possibly) radar. Questions remain about his exact contributions to radar, for his wartime defence projects have never been officially acknowledged by the British government. 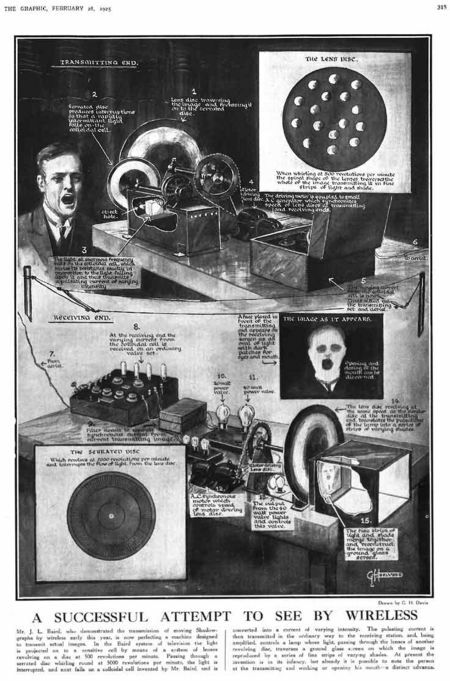 According to Malcolm Baird, his son, what is known is that in 1926 Baird filed a patent for a device that formed images from reflected radio waves, a device remarkably similar to radar, and that he was in correspondence with the British government at the time. Much of the information regarding Baird's work in this area is just beginning to emerge. Baird was removed from direct control over his company in 1933, well before the contest between the EMI and Baird systems took place. As part of the re-organization following Isidore Ostrer's acquisition of the firm, Baird was asked to resign. He remained a paid consultant, and his in-home laboratory on Crescent Wood Road in Sydenham was staffed by company engineers and supplied from its stores. There, even after the Crystal Palace fire had destroyed the company's own facilities in 1936, Baird continued his work on developing new forms of television. After the dissolution of the Baird company on the eve of World War II, he paid the staff out of his own pocket. In 1940 he demonstrated a 600-line colour system, and the next year improved upon it with a stereoscopic colour image. During 1944 he persuaded British authorities to make plans to adopt his 1000-line Telechrome electronic colour system as the new post-war broadcast standard. The picture quality on this system would have been comparable to today's HDTV. The Hankey Committee plan lost all momentum partially due to the challenges of post-war reconstruction. The monochromatic 405-line standard remained in place for three decades until the advent of the 625-line PAL system in 1967. From December 1944 until his death in 1946, Baird and his family lived at a house in Station Road, Bexhill On Sea, Sussex, England immediately north of the railway station itself. Named "Baird Court", Rother District Council gave permission for this property to be demolished and the land used for a modern block of flats in 2006, despite the efforts of many local residents who believed that this property should be listed and preserved due to its historical importance. His health, never robust, declined after the move and he died on 14 June 1946 after suffering a stroke in February. Television is now found in every corner of the globe and numbers among the world's most popular pastimes, offering multiple channels covering an enormous variety of subjects. Television standards and technologies have advanced in many ways, but much of Logie's vision remains. According to Ian Logie Baird, the inventor's grandson and curator of television at the National Media Museum in Bradford, "Even in the days of early television he envisaged a world with more than one channel, with two or three or four different channels. And he was also looking at the multi-channel thing going on with radio as well, so he was very in favour of choice for viewers and even different standards as well." With the switch to digital television, Ian Logie Baird and UK Digital launched a contest to find the oldest television in Scotland so that it could be converted to digital. "Ideally it would be something as old as 1936 when the first electronic TVs came onto the market," Logie said, demonstrating the continuing relevance of his grandfather's work. ↑ R. W. Burns, Television: An International History of the Formative Years, p. 264. This page was last modified 17:37, 22 August 2013.